There is no need to take the bull by the horns throughout this 5 reel as it will be the bull who will be taking care of you in a game that takes you on a journey through small Spanish towns that echo the sound of Flamenco music. Play slots online through 5 reels of flower, matador and ornate fan icons and see red when you win some free spins and amazing cash rewards. Check out the slots here at Wizard! ELK Studios was founded in 2012. They use high-level technology and advanced maths models to bring their products to life. Ensuring that there is still that human touch, ELK Studios takes the mobile slot games experience to the next level. The vibrant colours, fantastic graphics and animations bring the Spanish Village theme to life. You have front row seats as the mighty bull and the matador meet again for a wild bullfight. 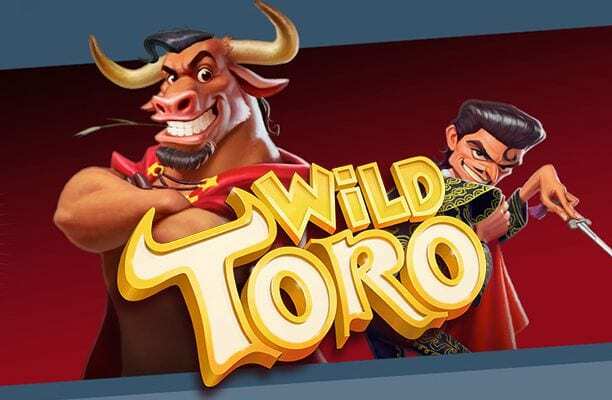 Wild Toro is one of the amazing games at Wizard with 5 reels and 178 ways to win. You can play on your mobile, tablet or desktop from 20p to £100 per spin. The symbols on the reels feature full red roses, Spanish-style hand fans, oranges with daggers through them, gold, silver and bronze coins as well as Diaz Jr – the Matador and the Wild Toro – the wild. You’ve also got 3 bonus features to keep you entertained. Are you looking for the world's best slot games online like this one? The Wild Toro feature which is triggered when the Toro Wild symbol appears on reel 5. Toro will move from reel to reel giving you a respin for every reel move. This feature carries on until Toro reaches reel 1 with all winnings accumulated. The lower paying symbols are represented by the 3 coins. These give you between 50 and 80 coins for a 5x symbol combination. The hand fan, the orange with a dagger through it and the red roses are your higher paying symbols. These grant you 200, 300 and an impressive 1000 coins for every 5x symbol combination! 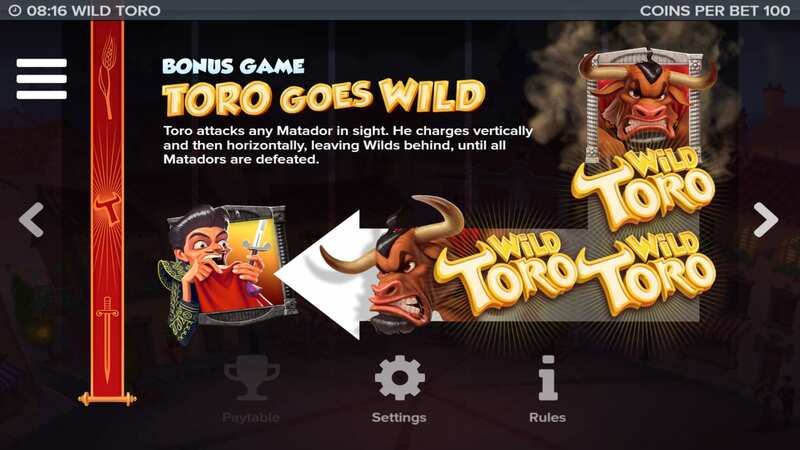 Then you have The Toro Goes Wild Bonus Game feature. This is played when the Matador lands on any position, on any reel, during the Toro Walking Wild feature. When Toro sees the Matador he turns into a raging bull, attacking all the Matadors leaving a trail of wilds for the next respin. When the Matadors are defeated Toro will then calm down and return to his normal self, a highly entertaining display. You’ve also got the Matador Respin Challenge feature. This is played when you have 3 Matadors on the 3 middle reels of the same spin. The Matador symbols become sticky during this feature with each giving you another respin. This means you have 3 repins in total. What’s brilliant is that this increases the changes of trigging the Toro Goes Wild Bonus Game feature. The feature only ends when all Matador respins run or if Toro defeats all Matadors. That means you have wins of up to 2, 250 times your stake on each spin! That’s why El Toro is the real hero of this game, so keep your eyes open for him and make sure you cheer him on when he arrives on the reels. Wild Toro is not a game that rests on its looks, it’s innovative and the bonus features are highly rewarding. 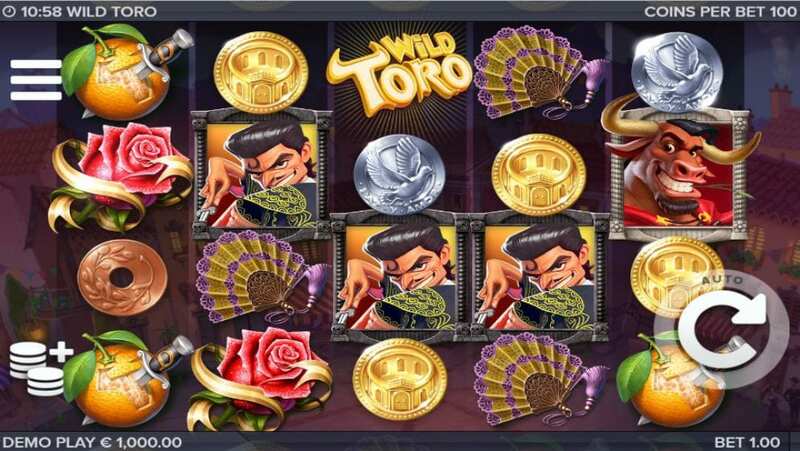 The key to winning big is through the Toro Goes Wild Bonus Game feature as you get a lot of wilds from the enraged Toro. ELK Studios have done an amazing job on this game. You’ll lose yourself in the scene; the whole town is gathered around the market square to witness the greatest bullfight in history. Who will win, Toro or the Matador? You’ve got to play to find out. If you liked this you might also want to try starburst slots.